CLICK ON THIS LINK BELOW TO BUY NOW! It will take you to EVERY retailer selling the book. ​ Jordan is the fast-paced, riveting story that answers the question - how would human nature react to a modern-day miracle in a viral social media world? They realize in the current world of viral social media, they must be careful. How to best employ the miracle without causing havoc? They plot a strategy. Despite their plans, word gets out too fast, and the world comes running - invading and overwhelming South Florida - along with serious danger. Television talking heads pontificate. Pundits opine. Some claim she's a messiah. Others insist she's the devil. Massive crowds gather, demanding to see Jordan. Everyone wants her. There seems to be nowhere to hide. Horrible rumors take hold. Protest groups march and riot. Mass hysteria reigns . . .
5 Stars "Victoria Landis has written a wonderful story about the titular character jordan, who is discovered to have special powers seldom seen in humans. The book relates her reemergence into the world after having been missing for three years. Her limited memories of the past complicate even the simplest of questions: Where has she been? Is there a larger purpose to her new powers? Who can she fully trust? Why is she here? The secondary characters have their own reasons to discover the same answers. Jordan finds people she can trust and begins to work the task she has been given as best she can. But for every miracle there is an equal and opposite backlash. Can Jordan win through the gathering darkness into a better world? "In Jordan, Victoria Landis takes her skill for developing characters and relationships to a new level. This work portrays a new view of an age-old question. How do people react when confronted with things they don't understand? A compelling story that reveals the many sides of human nature, told in Victoria Landis' talented manner." "What would happen if a young woman appeared with mysterious healing powers, a woman intent on using her newfound talents to improve the world? How would the public react? What about the media, the government? Would both welcome her with open arms? Or, would there be slanderous articles and broadcasts speculating on the source of her powers, perhaps accusing her of witchcraft or being Satan's offspring? Jordan lives these questions and many more. Follow her as she wends her way through friendship, love, and evil, only wishing to bring healing to those who need and deserve it." 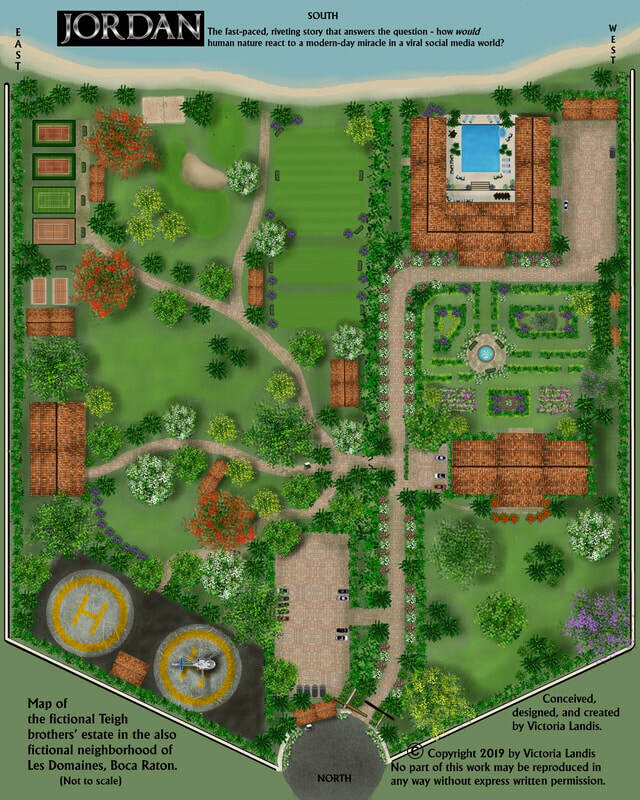 Here's a map of the fictional fabulous Teigh brothers' estate/family compound invented for Jordan . . . And the whole first chapter!